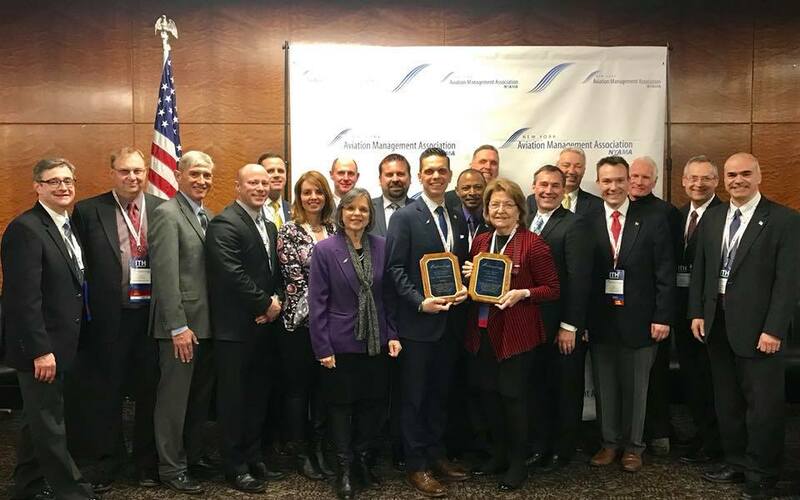 The New York Aviation Management Association sounded the call for increasing state budget appropriations for airports in New York at its annual Aviation Advocacy Day in Albany on March 19-20, 2019. The annual gathering of airport managers, corporate representatives, educators and other aviation officials dedicated to airport development provided an opportunity to meet with state legislators and educate lawmakers about the many ways the state gains benefits from its airports, and the importance of supporting the industry through the state budget.. This year’s event included the annual Legislative Aviation Caucus reception where attendees met with their state legislators in a social setting prior to holding individual appointments. NYAMA was welcomed to Albany by the New York Legislative Aviation Caucus co-chairs, Assembly member Donna Lupardo and Senator Monica Martinez. Warren Kroeppel was awarded the Bill Shea Award, and Senator Phil Boyle was honored for his years of service as prior co-chair of the caucus. Click here to read more. Advocacy Day attendees receive timely information on state budget issues and state-funded airport development programs. This event also provides a forum for constructive dialogue between colleagues and state lawmakers. All NYAMA members and aviation officials are welcome and encouraged to attend each year.